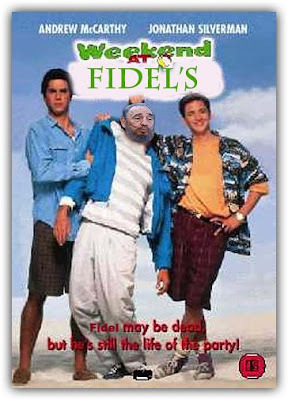 Fidel Castro: Most. Hilarious. Death. Ever. If there was ever a situation that the word schadenfreude was tailor made for, it is this. The story this time is that Castro has had several failed intestinal surgeries which have resulted in him, and this is a bit technical, pooping inside himself. Well...that's just a cryin' shame. I guess the brilliant Cuban health care system that is always held up to distract from the atrocities of the Castro regime isn't so hot after all. Huh. Who ever would have guessed? However hilariously tragic this may be, it doesn't mean anything until the Cuban government announces that Castro has died. But the guy is on his way out. (Just so you know, if you've pooped IN yourself, you're gone. Probably gladly so.) Can we please stop the idiotic embargo now? We've had this policy in place for almost one-fifth of the history of our country and all it has done is help guarantee crushing poverty for millions of people and give a brutal dictator an excuse for the God-awful living conditions he created. Oh and it drove an old man to poop in himself. (I apologize, but I can't get enough of that. BTW, guess how I'm gonna die now.) Funny? Yes. But hardly efficient. Comments on "Fidel Castro: Most. Hilarious. Death. Ever."